Being a parent is a tough job. So many decisions to make right from the get go. Where to have the baby. How to have the baby. How to feed the baby. Where to put the baby to sleep. Before you know it, it’s how to toilet train, how to handle screen time, how to deal with discipline, what to do about school. Whatever your decisions, it’s hard to catch a break. Judgment is tossed around like a hot potato, from one person or group to the next. Books and blogs, TV shows and podcasts, magazines and online forums. Sources that tell parents what to do are everywhere, and everyone wants to think they know what’s best for kids. I have a few ideas myself, of course. Human beings have to make judgments in order to decide how to live their lives, but making judgments and passing judgment are different things. When I became pregnant with my fourth child, I considered my knowledge about childbirth, my accessibility to midwives and medical care, and my personal desires in order to make the judgment that having a home birth was the right decision for me and my family. Plenty of people passed judgment on me for making that judgment, but since I was secure in my decision it didn’t bother me much. The same is true of homeschooling. I made the judgment to homeschool based on my eldest child’s experiences in kindergarten and my research into forms of education that didn’t involve schools. If I didn’t consider being a parent to be one of my most important jobs, I may not have made that choice. Instead, I may have just made sure my daughter was fed and clothed, and sent her off to make her way in the world of school. Did that make me a helicopter parent, a fate so horrible, so open to ridicule and disdain, that countless articles and books outline its terrible consequences? People who choose to homeschool their kids are often accused of being helicopter parents, or ruining their kids’ lives in any number of ways. Frankly, I don’t give a darn. I made the judgment that was right for my family, and felt secure in that, so I could weather the criticism. Of course, overbearing parents are a real thing. So are negligent parents. Usually, it’s not that black and white. Parents are human, and hence complicated. They may be overbearing or lax in one area and not another. They may be laid back and relaxed about one thing and flip their lid about another. I find that most parents I meet are doing the best they can. One of the things that bothers me about discussions of overparenting is not just that they are so darn judgmental. They’re often condescendingly didactic, chastising parents for doing things wrong, then telling them how to do things right. I see this, at least partly, as criticism directed against women. Of course men are parents, too, but the reality is that our society still sees women as primary caregivers, and the controlling, hysterical, unable-to-let-go mom is a heinous stereotype that plays right into discussions about overparenting. Because of the focus on helicopter parenting and overparenting, a slew of books, articles, blogs, and discussion forums have been generated that advocate the opposite. Free-range parenting is one example. Free-range parents let their kids take “risks” like walking to school or the park alone, and laws to protect parents who choose this for their kids are even being passed. While I’m not against those laws, they don’t address problematic social issues connected to free-range parenting. Neglect must still be defined and interpreted, and those for whom “free-range parenting” is a necessity rather than a choice are often unfairly targeted because of their socioeconomic status, race, or limited parenting resources. What all our discussions about being a parent seem to miss is a basic trust in the human instinct to raise their young. In a complex modern world it may be a challenge to tap into those instincts, but it’s certainly not impossible. I was 22 when I had my first child, years away from any knowledge of what our society terms “alternative” parenting or education. I paid attention to my pediatrician’s advice and saw Dr. Spock’s Baby and Child Care as my bible. And yet, I quickly discovered that letting my baby sleep with me made life so much easier for both of us. I discovered that if I paid attention, my baby could communicate her needs, and that if I met them, she was happy, and if she was happy, she was freer to grow and develop. When she was four, I had tapped into my instincts enough to ignore the revered developmental expert who came to my daughter’s nursery school and told parents to never, under any circumstances, let their children sleep with them. My daughter had her own bed at that point, but if she woke in the night she would quietly come into ours. When I told the developmental expert about this, and said that sometimes I was unaware of my daughter’s presence until I woke to find her beside me in the morning, she advised me to put a gate on my door. I have no doubt that any parents who followed that advice faced anguish in the process of shutting down their instincts. That baby of mine just had one of her own, and she’s learning firsthand about employing her parental instincts. The first time she went for a walk without her month-old son, she told me she felt physically ill. That’s not a sign of an overbearing mother, it’s the sign of one who’s bonded with her infant, an infant who will need her love, support, and care for some time to come. Letting ourselves be guided by our instincts is about trusting ourselves. When we trust ourselves, we’re better able to trust our children. That means we trust that when our babies cry, they need us. We tap into a space where we learn to understand their cues and respond to them. The more we do this, the more we settle into a calm groove, the more able we are to go with the flow, to be flexible and in the moment. In this way, being a parent becomes more relaxed, more peaceful, more joyful. It unfolds. By the time my third and fourth children were born, I was older, wiser, more settled, and more able to practice this kind of trustful parenting. Many of the things parents struggle with such as weaning, toilet training, and sleeping independently were non-issues. Things happened in their own time with little stress. Tantrums were rare, with traceable causes (for one child, it just meant she needed to eat). Discipline was nonexistent. We achieved the dance of respect and trust that allowed living and learning in the moment. While this may sound idyllic, let me assure you, there were plenty of difficult days, but the core of love and trust was always there. The belief in our kids as bright, competent people was always there. The desire to know them for who they are was always there. I don’t claim to have been perfect, but I do claim to have tried my best to be guided by my better instincts and intuition. When I had my fourth child at home, our midwife was simultaneously present and unobtrusive. I knew she was there, I felt her presence and her support, I relied on her skill and knowledge and caring. Yet at every moment she was allowing me and my family to have our own birth experience. An outsider looking in might have thought she wasn’t doing much, but nothing could be further from the truth. Her ability to both be there for me and let me have my own experience came in large part from her trust in my ability to give birth. Trustful parenting is the same. It creates a situation in which parents are very much present but not in the way. To me, that is the ideal. It’s not a matter of over or under parenting. It’s not a matter of choosing between hovering or detaching. It’s a matter of tapping into our instincts enough to trust ourselves, then extending that trust to our kids. It’s being present enough so they feel our love, protection, and support while they do their own thing. Do we need to trust kids more? Absolutely, but I don’t think we can get there unless we also trust ourselves. Beautifully written and well said as always. I find that if you can turn down the volume of all the noise around you, at the heart of it it’s like you say, all about trusting those instincts. Thank you. I so look forward to your posts! Our family came to homeschooling later (when my boys entered middle school) and your words always resonate with my own experience of learning to trust my instincts as a parent. 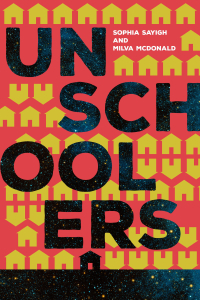 I loved your book Unschoolers and look forward to meeting you in Lowell next month. Thank you.